On my most recent day out with a camera I find myself rather ‘light’ on the photography, primarily because I was enduring a rather nasty cold. 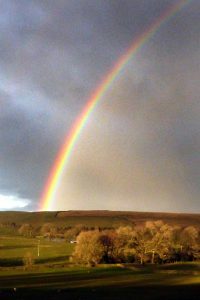 So, here is a ‘mini blog’ from when I took the train to the popular Yorkshire Dales tourist destination of Haworth. 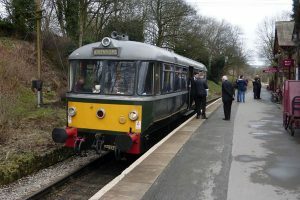 Class 142 Pacer Unit train at Wennington. Getting there was half the fun, though I wouldn’t so much call the rattly near vintage train from Lancaster to Keighley itself ‘fun’, especially if you try to consume a hot drink! 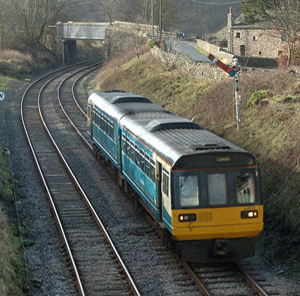 These ‘Pacer Unit’ trains were budget built on mass and still widely used (unfortunately) on the Northern Rail network,even though some being ‘refurbished’ with newer seats has helped a little. I snapped this one at Wennington, some years ago. I went seriously, but purposely, ‘vintage’ on the last leg of my journey, switching to the Keighley & Worth Valley Railway and finding myself on a curiously quirky 1950’s railbus for the short ride up the valley. 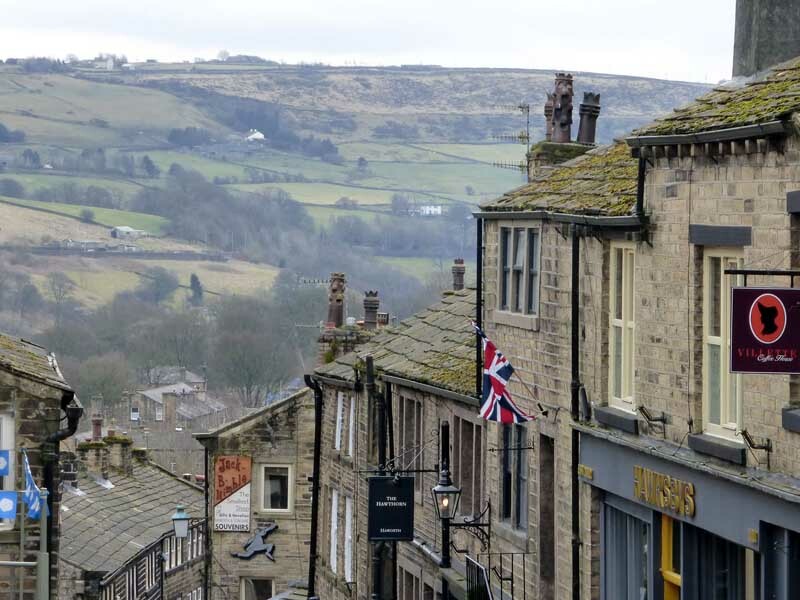 Now, the quaint little town of Haworth is indeed very photogenic, but shots are often marred by the hoards of visitors and periodic traffic bumping it’s way up and down the cobbled main street. A lovely street scene can be easily spoiled by an ASDA delivery van unloading in the foreground. That’s why I opted to capture something a little more tranquil. It’s instinct to generally shoot at eye-level but tilt the camera upwards and use a telephoto lens to snap chimneys, traditional street lamps and rustic rooftops. I positioned myself carefully to try to cut out most modern signage. The hazy hillside on the far side of the valley gave a pleasing backdrop that shouts Yorkshire Dales. 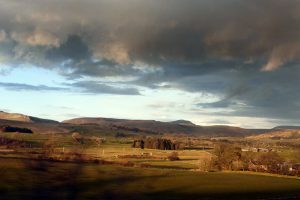 Edge of the Yorkshire Dales near Clapham. As the sun went down and clouds started to clear, the low light created lovely warm colours in this early evening shot taken near Clapham on my way back to Lancaster. 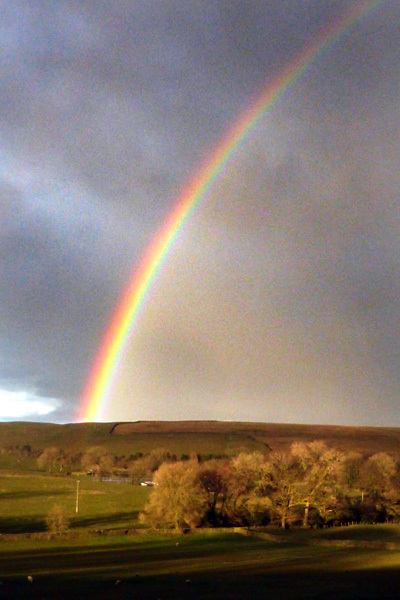 You have to be quick (and lucky) to capture a nice shot of a rainbow, which I achieved in similar lighting and landscape to my previous view. This one was particularly vibrant and easy to photograph with minimal editing afterwards. And why not end with another of my old favourtite shots, a Morecambe Bay sunset? If you’re snapping from the train window, as I was on this occasion, you need to be extremely quick. The sea is only visible clearly for a few seconds! 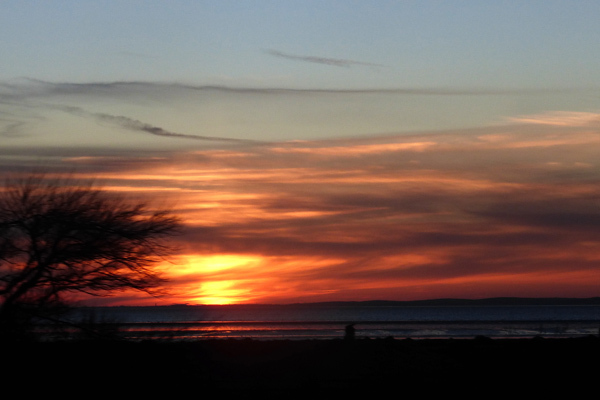 Morecambe Bay sunset from Hest Bank.